Mobile phones have undergone a huge change at a fast pace in the last decade. From the huge bulky keypad phones to ultra slim, touchscreen phones mobile phones have taken a giant leap. Megapixels to quad-core processors, and if this was not enough, you come across a new term 4G technology. This new mobile internet technology has caught everyone in awe. 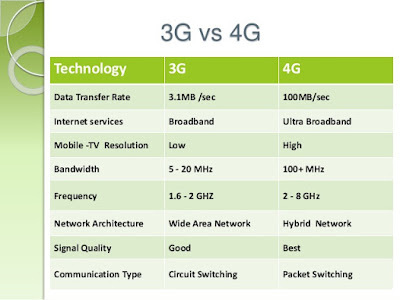 If you are wondering, what is the difference between 3G and 4G technology, you are not alone. We shall explain the difference between 3G and 4G technology in the following paragraphs. What is 3G and 4G Technology? 3G stands for third generation and 4G stands for fourth generation mobile Internet technology. Both are used for the same thing, that is, provide Internet to smartphones. However, there is a slight difference between the two that is discussed in the next para. 4G technology offers Internet speeds that are 10 times faster than 3G technology. The average download speed on a 4G network is 3 to 6 Mbps with peak download speed of more than 10 Mbps. On the other hand, 3G offers average download speed of 600 Kbps and 1.4 Mbps with peak download sped of about 3.1 Mbps. 4G technology has not reached all urban as well as rural areas. Thus, many consumers still have to settle for a 3G network as their regions are still not 4G enabled. You do not need to pay anything extra for a 4G network. All you need is a new SIM card that most mobile operators offer free to consumers who wish to switch to 4G technology. You require a 4G-ready handset to enjoy 4G technology. Thus, you have to buy a new phone if your phone is not 4G compatible. As you can see, 4G is the choice for mobile Internet if you wish to do more than just VoIP calls. Thus, speed is the major difference between 4G and 3G technology. Unable to login with twitter account in 3G but no problem in 4G phone what's reason? 3G and 4G network not available of our area but Vodafone 4G are available in my area. I don't understand about it. Great piece of invention from 3G to 4G smart phone! How do to download this appk? hi good day all of you. My whats app ID number is +880 01822816584,ID Name is Mir Mosharrof Hossain Shahin.Pls add me.